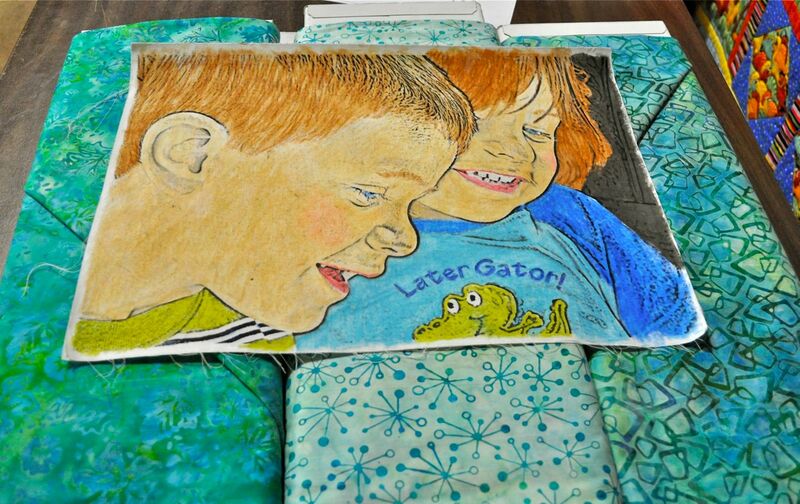 Quilting and Life in General: 2012 - it's a wrap! 2012 - it's a wrap! Bye Bye 2012!! That year did go by at the speed of light. But looking back, I did manage to get a lot done. DH and I enjoyed a week in Palm Springs at the height of grey, rainy winter at the Oregon coast. I hung out with friends and a quilting group Sweet Pea is in when in Palm Springs area. Great fun - and something I hope to do again this winter. I traveled to Nebraska twice this year. Once for Mom's birthday in April and again in October to help get her ready for winter! And of course, attend the Quilt retreat at the 4H camp!! Believe it or not there are 26 FINISHED projects from 2012!! Whoo-hoo!! Starting with a composition bookcover for a swimming friend (no picture). Then 4 baby quilts for the Brookings Community Baby Shower; 5 name banners; flannel receiving blankets; 3 twin tops for some of my sister's Grandkids; 6 Christmas stockings with 4 more to finish in 2013; a Green Bay Packers cloak for the neighbors' cast iron pig bank [I'm sorry to report it's the 'cloak of defeat' - unintentional, I assure you!!] a few challenges; and more! 1. My UFO - Pies and Tarts - hand quilted by a group in Nebraska. A challenging project for a 'non-applique' person. But I love how it turned out. 2. Community baby shower log cabin quilt - from blocks left over from my DS's wedding quilt the year before. 3. Best Buds - a 'out of my box' class I took. Picking a photo; having it photo-shopped and then painting it, then FMQing it ... grow, grow, grow!! I love it and may have to spirit it back my DD's and hang it here. 4. Miss P's kindergarten quilt. I adored reproducing one of her drawings of a unicorn. I enjoyed working with the bright and WOW fabrics - still stretching that box!! 5. Those sunflower table runners - what fun to have them out and not hidden away as the worse pillow shams ever!! 6. Reminiscing - I love this quilt and so glad I got it finished this year!! 7. Bento Box meets Broken Dishes - the UFO I finished for my DH for his Father's Day present - it even kind-of goes with our couch!! I also read 62 books this year - almost all fiction, because it's me!! Several historical fiction through our book club. Recommendations?? Jack McDevitt - science fiction series that starts with "The Engines of the Gods". I love his characters and the SF is more personalities; less technical stuff!! Suzanne Collins' Hunger Game series - I'm not sure I put them down. I know I was desperate for the 3rd one!! Long lines at the library! Buried Prey by John Sandford: I love this series and this one was a 'cold case' that gave us more info about how it all came to be. Redshirts by John Scalzi Science Fiction - I like Scalzi's sense of humor. His first book I read was "Old Man's War"
Dies the Fire by S M Stirling Science Fiction - End of Civilization story here in Oregon - I really enjoyed the characters in this series too. Wife 22 by Melanie Gideon Fun premise and a new twist on 'empty nest' syndrome! And yes, I'll admit it .... 50 Shades of Grey series by E L James What can I say - it was addicting!! And we had so much fun giggling about the fact that we were reading it ... a true guilty pleasure!! Oh, and one more great moment!!! 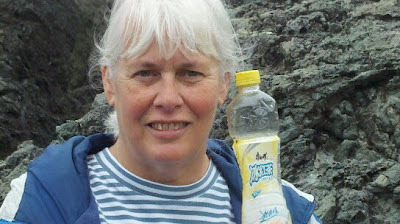 Finding a Japanese Ice Tea bottle washed up on our beach!! Probably from the Tsunami ... just think of it's journey!! loved your recap!!! i look at my sea glass often and remember my trip up to meet you! would love to do it again one day.